Seurasaari Island and Open-Air Museum and Katajanokka are good opportunities to explore the local culture. Do your shopping at Hakaniemi Market and Okra. 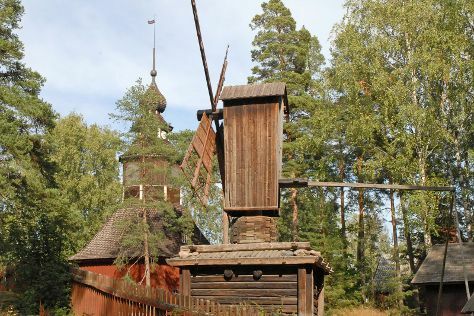 You'll find plenty of places to visit near Helsinki: Porvoo (Porvoo Old Town & Cathedral of Porvoo) and Kotka (Langinkoski Imperial Fishing Lodge Museum, Maritime Centre Vellamo, & more). The adventure continues: contemplate in the serene atmosphere at Rock Church, explore the world behind art at Kansallisgalleria, contemplate the long history of Mannerheim Museum, and learn about all things military at Sea Fortress Suomenlinna. To see where to stay, reviews, traveler tips, and tourist information, refer to the Helsinki online tour planner . If you are flying in from Hong Kong, the closest major airport is Helsinki Vantaa Airport. August in Helsinki sees daily highs of 24°C and lows of 13°C at night. Cap off your sightseeing on the 5th (Mon) early enough to travel back home.